A member of the Kansas Bureau of Investigation stands armed and ready atop a Hummer during a manhunt Tuesday morning along U.S. 75. A group of riders brought a new level of use to the Flint Hills Nature Trail this week, crossing Osage County as part of a horseback on a six-day forwarding ride. The ride was organized and led by Carol Retzer and Rick Antisdel of Salt Creek Ranch, near Lyndon. The couple invited 20 riders for nearly 100 miles of riding, primarily along the converted Kanza trail. The group camped just west of Osage City after riding 17 miles, almost entirely along the trail, becoming one of the bigger groups to cross the recently opened pedestrian bridge spanning U.S. 75 along the trail. Eichorn’s horse, Blue, crouched down when a semi and trailer passed below the bridge, but was otherwise okay. Most of the horses were broken-in to such rides, and passed with ease. In addition to the ride, several members of the group were also using the experience to help train horses in a live environment. Kinsey rode with his father, Mike, who runs a horse and rider training school in Belton, S.C. Two of his interns also joined the ride, Lori Childress, Greenville, S.C., and Yasmine Ouertani, Bordeaux, France. Mike Kinsey had joined a previous trail ride with clients and another with his daughter. This time he rode alongside his son. “I get a chance to meet my kids this way,” Mike Kinsey said. Childress hoped any exposure of the ride would entice more people to the trail. “Maybe more people will see it and get some use out of it,” Childress said. The experience has kept Retzer involved in trail rides for 20 years, organizing three rides in recent years. “I’m addicted to the horse side of it, along with the people and history,” Retzer said. Retzer is a regular rider and user of the trail. 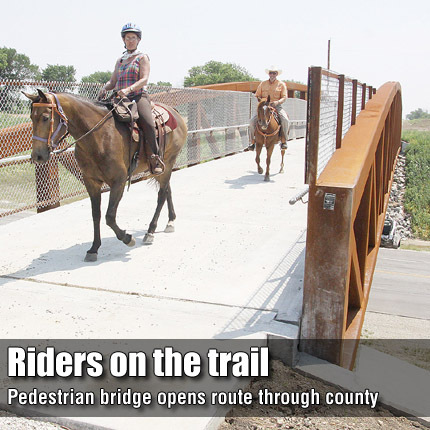 As much as she can, she takes a bicycle or horse to work, a 4.5-mile ride down the trail from her home to Rural Water District No. 3 in Vassar. The Rails to Trails program has its opponents. Cases misuse along the route, including unsafe fires, vandalism and dumping, have been fueling their cause. “I don’t blame them,” said Sandy Wilkes, Stillwell, on of the riders in the group. She felt the situation has improved as rail beds are being converted into usable trails. “Since the railroad isn’t there, they think they can drive right up onto it,” said Joleen Day, who joined the riders west of Osage City Monday evening. Day lives along the Flint Hills Trail at the Morris-Lyon county line, about seven miles east of Council Grove. She has experienced minor issues with trespassing since the railroad cleared the right of way. Day and the others were to ride through the area toward her land on Tuesday and Wednesday. One solution to the associated problems has been to install posts at entrances to the trail from roads, but they too come with caveats. Many of the riders in the group shared the opinion that the solution to keeping the wrong people off the trail is to keep the right people on it – maintaining and using it for its intended purpose. Retzer believes the area between Osage City and U.S. 75 is one of the areas needing the most work. The riders appreciated the trail and sung the praises of those who maintain it.